Chicken, leeks, and herbed cream cheese on a tender sweet potato pizza crust. Changing it up again--recipe first, words later, because I'd like to share below how I store some crops from the garden and the CSA farm share. One long term storage crop is sweet potatoes. I've made pizza crusts from (links to my other recipes) shredded butternut squash, roasted or shredded beets, steamed spinach and steamed kale. Why not sweet potato? Just like the addition of sweet potato to biscuits results in a tender crumb, adding it to pizza crust results in a tender, flavorful crust. I made a triple batch of dough and will share have shared my creations throughout this fall--including 2 delicious FFF-a-boli rolled pizzas, one for vegetarians and one for omnivores--created using ingredients that will be leftover after Thanksgiving. Everything is up on the Visual Pizza Recipe Index. First up, a white chicken leek pizza (with a fresh tomato pesto & fontina option for vegetarians, photo below), since I got both sweet potatoes and leeks in last week's CSA farm share. Dump the sweet potato, water, and yeast in a bowl (I use my stand mixer for this). Let the yeast dissolve while you're getting out the other ingredients. I'm weighing flours these days, using my cheap little kitchen scale bought at Bed Bath & Beyond with a coupon. Simple and easy--no fluffing or sifting or measuring, just scoop until you like the number on the scale. Add dry ingredients, and olive oil, and mix with a paddle on low for a few minutes, then spin it up to medium for a few minutes. Stop the mixer, scrape down the sides, and mix again with the paddle until a dough ball forms. Transfer to an oiled ziptop bag and chill for up to 3 days or freeze for a couple of months. Preheat oven to 425 degrees Fahrenheit and if you've got a pizza stone, pop it in there to preheat as well. On an oiled piece of parchment paper, stretch out the dough into a circle or square, your choice. Using an offset spatula (Amazon link, but I got mine at Michael's craft store using a coupon ) or the spreader of your choice, spread the cream cheese across the dough. Top with chicken, leeks, and cheese. 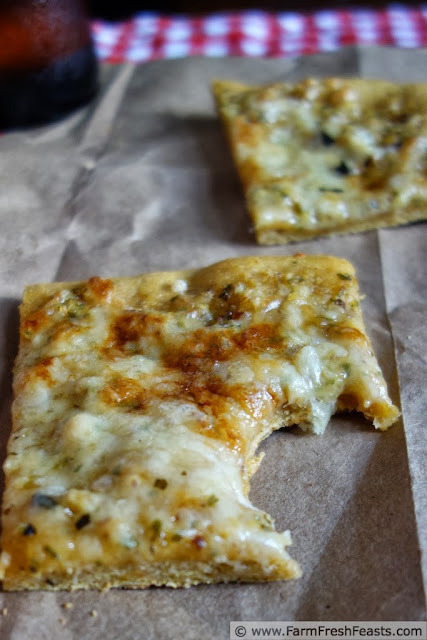 Bake for 5 to 8 minutes on the parchment paper, then shimmy off the parchment and bake directly on a pizza stone, or cookie sheet, for another 3 to 5 minutes until cheese is browned. Cool on a rack, then slice (Amazon link for my favorite pizza wheel) and serve. The transition to fall crops brings some relief from the 'use it or put it up--quick!' mentality of summer crops. Sure, yesterday's beet greens were this morning's brunch (FB page photo), and one of the summer squash got finely shredded into supper, but I've also started up the SWSR2013 (FB page photo)--the Strategic Winter Squash Reserve, 2013 Edition. The onions, potatoes, and pumpkin went straight over there, joining uneaten storage crops from earlier weeks. Last winter I ate from the last--butternut--squash from the Reserve in late April! If you have a cool, dry, dark corner of your home, please consider starting your own SWSR. 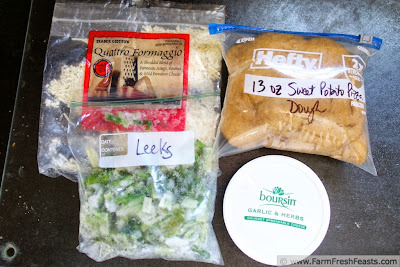 This post is shared on the From The Farm Blog Hop, Clever Chicks Blog Hop, Tasty Tuesdays, What's Cookin' Wednesday, and What's In The Box. 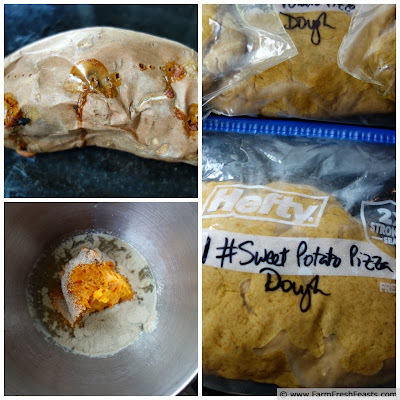 The kids in my family don't like sweet potatoes, but I'll bet they'd eat it if I hid it in a pizza crust. Don't tell them, but that's what I'm going to do! I'm not a big believer in hiding vegetables, but I'll tell you that the sweet potato is much less . . . obvious a color than say, spinach, if you're going to "enhance" a crust with an unannounced vegetable. This sounds like a fantastic flavor combo!!! Thank you-it does go very nicely together! you've done it again!! I love your pizzas! We should be having a pretty rainy weekend here, so it'll be fun to whip this up. Rainy makes me crave stew and soup, but hey, pizza would also be good. It is a terrific combination--and would make a good soup + bread too. Oh, sweet potato crust! I've heard of regular potato and cauliflower, but I never would've guessed sweet potato. Pinned to try. Flat bread sounds good to me! I love this pizza, even with the chicken. Despite not being ready to eat it, I can see the value it has. I like the idea of throwing a little hot sauce and blue cheese on top and calling it a Buffalo Pizza as well, although I'm sure you've done that already. 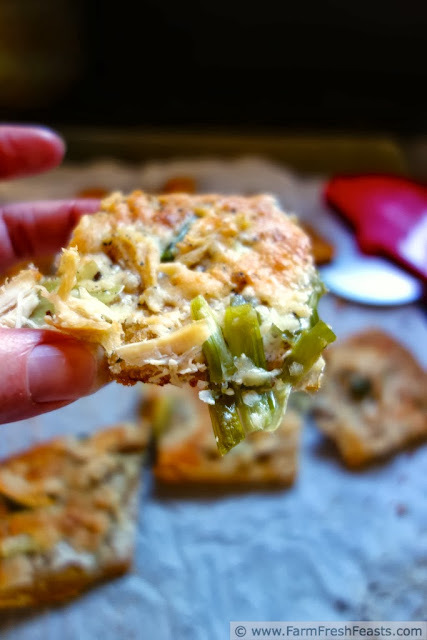 Yes, my celery leaves from the never-say-die celery plants in the garden are featured in a buffalo chicken pizza. I don't know that bugs won't get to the stuff in the root cellar first, which is why my stuff is up where I can take a glance at it daily. I suppose you could get some playground sand and bury it in the cellar in sand, to keep bugs more away from it. I've made sweet potato bread, but never thought to turn it into pizza crust. Brilliant! Now I'm craving sweet potato biscuits. There's no satisfying me. Oh, yeah! We love sweet potatoes, but mostly eat them as a vegetable. Now I can combine two of our favorites in one dish! Or instead of pizza crust, I might put them in yeast bread. Time to experiment! I'm realizing that my kids don't eat a lot of sweet potato/squash type things as a vegetable, which is probably why I need to experiment. Is one of the pitfalls of cohosting the increase in hunger due to all the yummy photos?